Make Soft-Ride Comfort Boots part of your lifestyle and ensure your horse’s comfort in the stable, in the trailer, and on the road. Soft Ride boots should be used as preventative care for sound horses, as well as a horse is recovering from injury or disease. While Soft-Ride’s patented boots with gel orthotic inserts protect a horse’s hooves and keep your horse healthy. 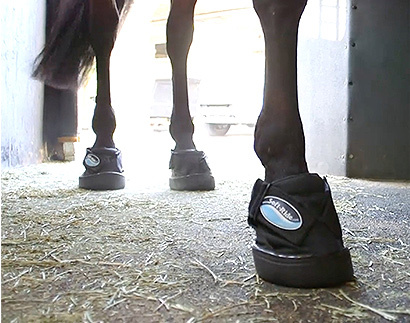 As a horse subtly shifts his weight while standing, the gel orthotic cushions loading and unloading the sole of the foot, helping to maintain proper blood flow to the entire foot and hoof. Soft-Ride boots can make any stable feel like a perfect pasture. Rested and Ready - Your horse will be rested and ready to perform, even in a stable with a concrete floor. Eliminate Stall Mats - You can enhance or eliminate stall mats and reduce the amount of bedding in your horse’s stall. 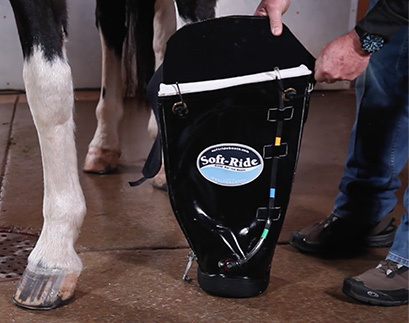 Soft-Ride boots help make travel less stressful for you and your horse. Smoother Roads - Your horse will enjoy a smoother ride and less vibration from the trailer floor when traveling on the road. Rested Travelers - A more comfortable and protected ride helps your horse walk off the trailer rested and ready to perform. Paddock Protection - Protect your horse’s hooves from pebbles and debris when walking through unfamiliar parking lots and paddocks. 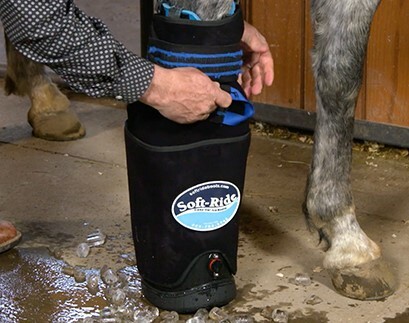 Injury Rehabilitation - Soft-Ride Comfort Boots and Ice Spa Boots allows a sore-footed horse to remain upright, mobile, and comfortable during rehabilitation. All professional athletes, human and equine, should soak in an ice bath after a hard workout or game: it helps them recover more quickly. Hard Workouts - Hard workouts lead to muscle growth, but that can also cause soreness. Icing reduces recovery time between workouts and Soft-Ride gels provide comfort while encouraging enhanced blood flow through the hoof. Competition - Competitions often happen on the road where horses are more confined than usual. Soft-Ride ice spas help with recovery time between competitions and Soft-Ride gel orthotics help prevent horses from becoming stocked up and sore in the trailer, stall, or parking lot between events.